and have been for a long time. models, sizes and handle dressings. or slip joint, and can be made with screws or permanent pins. 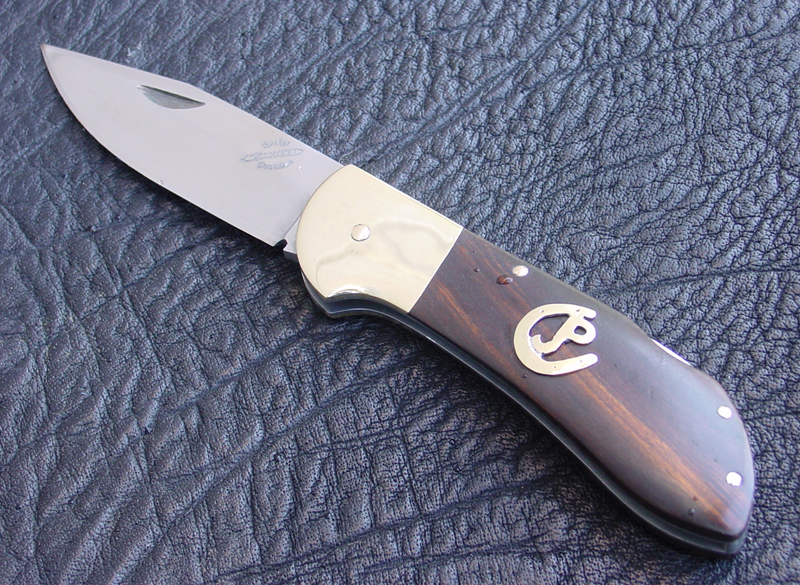 custom folding knives made to order. Above shows a really nice version of a lock blade. made from 1/8" thick carbon damascus steel. The frame is fileworked &heat-colored 6Al4v titanium. Bolsters are "checkerboard" mosaic carbon damascus steel. instead of using permanent pins. Price for a similar piece is USD$850. Below is a two-blade version of the Persian design above. We call this one our folding hunter. it just has two of them. The frame is 410 fileworked stainless steel. 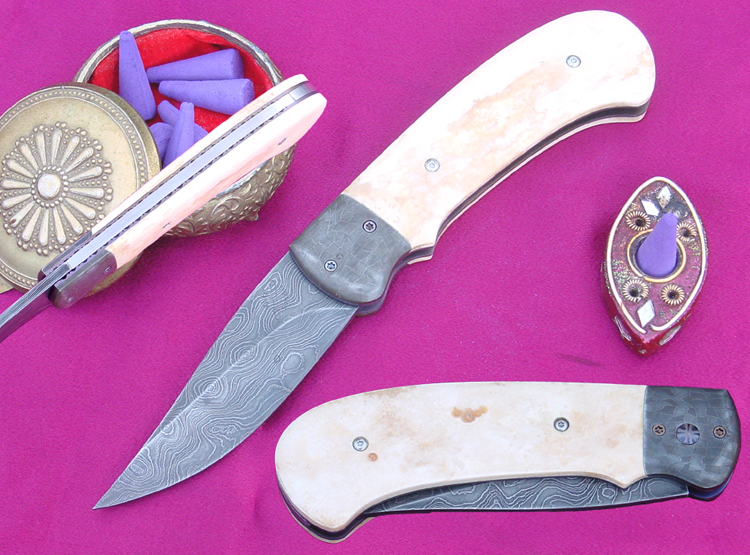 The handle is white micarta, soldered bolsters of 416 stainless steel. This version put together with permanent pins. Price for a similar folding hunter is USD$750. Below shows a medium-sized lock blade folder. It has a 3" blade made from 3/32" thick 440c stainless steel. Heavily fileworked 410 stainless steel frame. The handle desert ironwood, bolstered by 70-30 yellow brass. 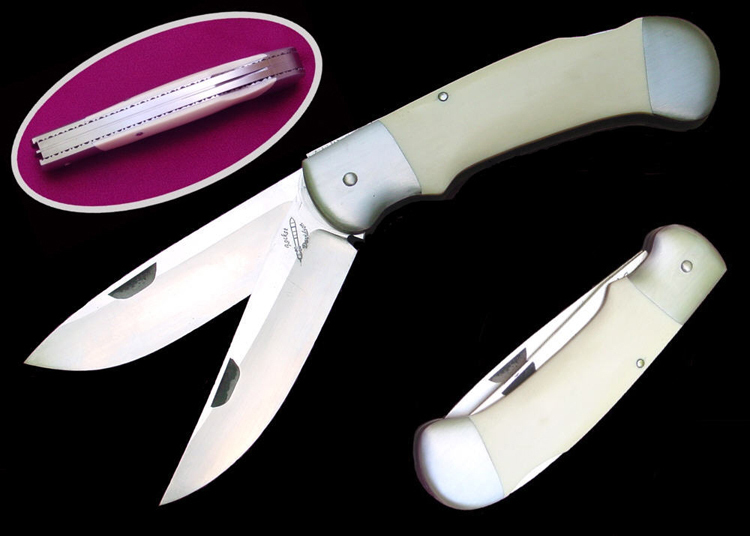 Price for a similar lock blade folding knife is USD$350. The brass escutcheon is extra.